I'm surprised that I've been able to drag my summer vacation out for this long. However the truth of it is that not all that much has happened since then. This will be the last mention of summer. Following this will be a single post on National Day which happened in October. We stayed two nights in Chengdu. This is the capitol city of Sichuan province so naturally local food was the first thing on our agenda. I'll tell you a secret though... gong boa ji ding in Wuhan is just as good as the gong boa ji ding in Chengdu. In the same vien, Beijing Duck in Wuhan is also just as good as the Beijing Duck in Beijing. It is completely counterintuitive (a word that I recently had to explain in English Corner) but it is basically true. Another counterintuitive thing that we've discovered is that the food in smaller, less expensive restaruants is actually better than the food in the more expensive places. Sichuan cuisine has a reputation for being spicy but as many people have recently pointed out to me there is more than one variety of spiciness. When Chinese people think of pure heat they don't think of Sichuan but rather they think of Hunan province. Sichuan food, though still hot, is often meant to have more of a tingling or numbing sensation. Our first night in the city we went to an area called Jin Li. We were looking for a Chengdu style tea house but instead we opted for some street food. There is a snack in Chengdu called Dandan noodles. These are similar to re gan mian in the sense that they are cheap and can be found just about anywhere. The texture of the noodle as well as the sauce are both a bit different though. If I recall corectly (and there is a probability that I do not) we forewent actual meals and instead gravitated from stall to stall consuming little snacks here and there. The following morning we spent in another snack street called Kuan Zai Xiang Zi (Wide and Narrow Alley). Here we did much the same as the night before. We also spent a large portion of the day in the Wuhou Shrine. This is a shrine which was originally built in 223 AD which houses the mausoleum of King Liu Bei as well as several halls which memorialize different ministers and generals; all of whom were important people in China during the Three Kingdoms Period. The shrine is now part of a larger museum which costs 55 kuai per person to enter. There are different statues and budhas representing all of these important people. There are also performaces throughout the day. One of these performaces is a Sichuan “face changing” opera. There are some videos below. The museum is also home to some light and shadow artwork. You'll see this also in a couple of the videos. In one there is a sculpture that is esentially a white L shapped wall with a face in one side. Every so many minutes a projector off to the side displays a series of images using the wallas a screen. The projected video is meant to show different moments in the history of China but it also ends up resembling a “face changing” performace. When you look through the photos below you'll notice that a couple of pictures show writting on a wall. This is in the stairwell of the hostel in which we stayed. If memory serves the writting is a list and description of various snacks that are famous in Chengdu. Most of the photos come from the Wuhou Shrine. I do not henestly remember where the others are from but I do know that they were somewhere in Chengdu. I tried to embed these videos but LJ is being difficult. So... if you click on the links it should open a page on Youku.com and you can see the videos there. The best laid plans of mice and men sometimes get piled over by torential rains and covered with mud. Okay, so maybe those aren't exactly the words that Mr. Browning used but I think he'd agree. 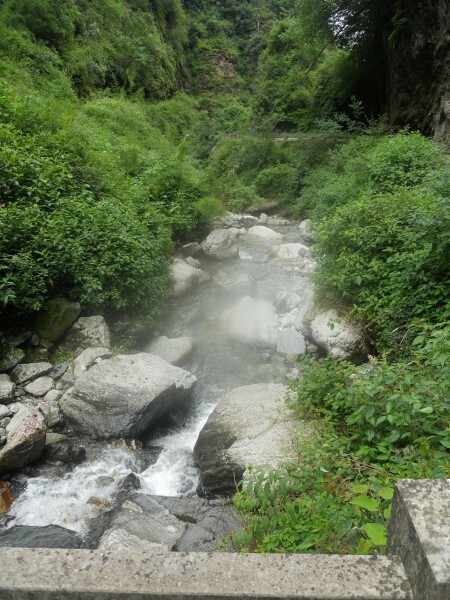 One of the things I wanted to do in Yunnan province was hike through Tiger Leaping Gorge. With a name like that, who wouldn't want to go there? But it was more than just the name. The gorge is a well known set of hiking trails that supposedly leads through some of the best scenic views in China. Parts of the trail are also supposedly very challenging. When we left Li Jiang we were not actually heading straight to Shangri-La. We were intending to go first to Tiger Leaping Gorge. However we were told along the way that parts of the gorge were closed off due to the heavy rains having caused some mud slides. So instead we went to the Shangri-La. From there we took a bus into Sichuan intending to go straight through back to Hubei. This trip began on a bus which only took us part of the way that we'd planned. China doesn't really have an interstate highway system connecting the whole country the way we do. There are no I-49s or I-20s anywhere to be found. There are however thousands of small back country highways. 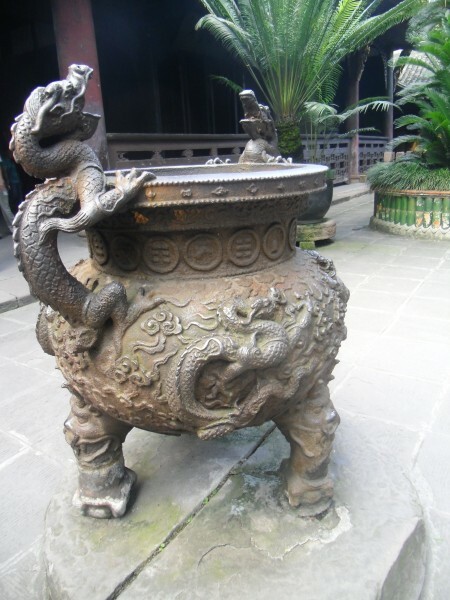 In Yunnan and Sichuan these snake and twist around mountains. Occasionally there is a tunnel that they pass through but these are rare. Very often you will travel a length of road that curves around one mountian and allows you to watch the passing length of what you think is a a different road wrapping around a second mountain only to find an hour later that you are now viewing the first mountain from the second because it is one road and not two. In the end it looks like you're taveling a very long way only to go a short distance. Looking down from the side of the roads though, the slope of the mountains show the neccesity of this. There really isn't any other safe way to do it. 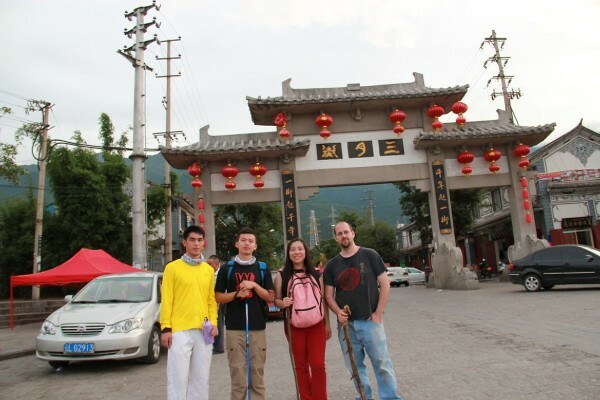 On July 21st we left Shangri-La (or Zhongdian...) by bus traveling into Sichuan. The bus went as far as a small county town of De Rong. We had planned to get a bus from here to continue on but unfortunately we were told that there would be no busses running for that day and probably the next several days because the roads were too dangerous. Instead we shared a van with a couple of Korean guys. I don't know if a bus would have been any less safe but it would have likely been slightly more comfortable and a lot less expensive. The Koreans were here exploring hiking trails. One of them had been to China for hiking the year before. He spoke enough Chinese to converse with everyone else and he knew a good amount of English but rarely used it. He did what a lot of people do when they have a basic understanding of a language but no confidence with it. He would speak to Xu Na in Chinese and when she translated what he said he would nod his agrement and say “yes, yes...” or repeat the English words that he understood as if he were trying to emphesis the point. The 21st ended with us in a little town called Xiang Cheng. We found a cheap hostel that was run by an old man who boasted about having a large water tank on the roof of the hotel enabling him to have more hot water than the other hotels in the area. At some points on this trip hot water was a bit of a luxury so the promise of a hot shower in the morning (or any time of day to be really honest) was enough for me that I would have paid twice what he was asking. This old man also enlightened us a bit on Shangri-La. According to him the area of Sichuan that we were now in, including Xiang Cheng and several other small towns, had a greater claim to the description of the utopian society writen of in The Lost Horizon than Zhongdian had. He knew all about the book and the changing of the name of Zhongdian and he seemed a bit offended by it. He kept telling us that we were now in the REAL Shangri-La. Having now read the book I actuall have to sort of agree with him. Nothern Yunnan had mountains but there were a lot of flat places also. Much of the area was grassland which was perfect for tending herds of goats and yaks. Hilton's descriptions of the Tibetan boarderlands where Shangri-La was meant to be located was of saw-toothed mountains as far as you could see and treaturous slopes and rocky mountain passes. Western Sichuan much more closely fits this description. The morning of the 22nd we again found our Korean friends and traveled with them by van to another small county town called Dao Cheng (which means Harvest County). Here we negotiated with some of the locals to take us, along with the Koreans and two other people to a small mountain top town of Ya Ding. Ya Ding is actually a tourist destination but it is a rather isolated one. It was just the kind of place that I wanted to go to. It had everything that Tiger leaping Gorge was meant to have. It was essentially five or six ramshakle hotels with tiny shacks built around them possing as restaruants. There was only one bar in the whole town. In their one bar the locals put on a show performing a trditional dance on this tiny wooden stage. The hostel that we stayed in was made of stone and wood. The window of our room looked down a long slope into a tree carpeted pit created between mountains. There was a large common room in the hostel that was made entirely of wood. Here there was a stove burning constantly heating the room. There were also serval tents set up in this room. In most hostels you can rent a private room or just a bed in room with several other people. Here you also had the option of renting one of these tents and sleeping on the hardwood floor. I'm assuming that this was their cheapest option. 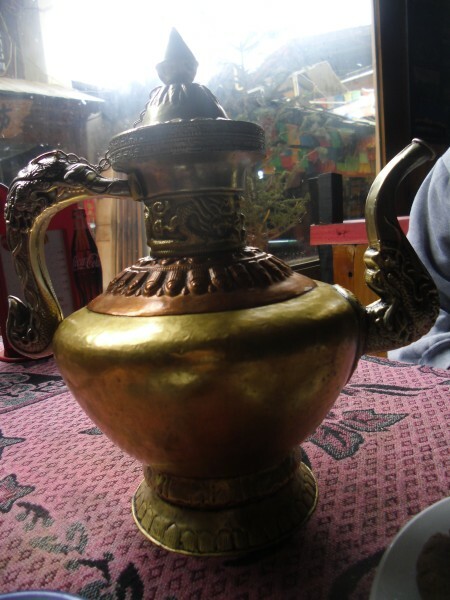 The hostel owners made yak butter tea here for the guests. Outside there was a dirt road that curved downward in both directions. The town was the entrance to a series of hiking trails that lead all over the Western Sichuan mountains. It is rumored that one can actually spend a few days hiking and reach Lu Gu Lake from the Sichuan side. Ya Ding as a beautiful place. I loved it there that first evening. Unfortunately, Ya Ding didn't love me... and I never had the chance to explore any of those kiking trails. It was difficult to breath. That was the first thing I notice and I noticed it a long time before we actually got to Ya Ding. On the van ride there we had made a few pit stops and in walking between the van and the side of the road I noticed that I was breathing as hard as if I'd been running for ten minutes. This didn't only happen when I was walking. The night that we spent in Ya Ding was a strange one. Without any exertion at all there would be little moments when I found myself breathing rapidly. I had trouble sleeping that night. It took longer than usual for me to get to sleep and once asleep I woke up repeatedly. Once I woke up thinking that it was morning only to find that it was still the middle of the night. When morning did arrive I was tired but not just from the lack of sleep. I couldn't think. I had a headache. I felt like I was on the verge of vomitting all the time, though I never actually did. The few locals who saw me that day kept muttering things to me in Chinese. I'm told that they kept asking me if I felt dizy. They were also suggesting that we get some kind of root tea. I spent about half the day laying in one of the beds and occasionally drinking this strange tea while she went to go look for the guy who brought us here in the van. When she returned she had arranged for us to head out on the next van going back to Dao Cheng. The road between Dao Cheng and Ya Ding doesn't simply wrap around several mountains. In some places there really is no road. In a few places there is nothing but rocks everywhere. I recall looking out through the windows at the surrounding land and seeing a sea of boulders in every direction. I remember Gettysburg having looked almost like this when I was there. But there were more rocks here. As many of them were beneath the van as there were in the fields and I felt every one of those. The whole ride down I felt like I was going to puke. I'd felt like this the whole day. But I was the only person in the van who didn't. Even the driver pulled over to the side of the road at one point so that he could run off to wretch off a cliff. Eventually we were back in Dao Cheng. We found a hostel here and I promptly curled up in the bed and did nothing for a very long time. When I did move again I googled altitude sickness. There are a variety of symptoms and it seems that it effects different people differently. The most common symptom is dizyness. I never felt dizy but webmd and wikipedia listed everything else I had felt. Dao Cheng is still up on a mountain. From what I can assertain, Dao Cheng is somewhere around 3500 meters above sea level. Yading is about 4000 to 5000 meters up. It would seem that a mere 1500 meters makes a hell of a difference. The next day I felt better. I didn't feel normal exactly but better. We tried that morning to get bus tickets out of the area heading east and failed. All the bus tickets had been sold out by the time we go to the station. Because of this we stayed two nights in Dao Cheng. The next morning we again stood in line trying to get bus tickets and again we failed. We discovered that people who work at the hostels have arrangements with the bus station so that they can buy blocks of tickets for ten to fifteen people at a time. It only takes three or four hostels doing this for all the tickets to be sold out. The bus station in Dao Cheng is always surrounded with men who offer van rides to people who can't get a bus ticket. Eventually we did make it to Chengdu which is the capitol of Sichuan. In 1922 Austrian American Joseph Rock began exploring areas in Tibet and China including Yunnan, Sichuan and parts of Gansu. Rock was a botanist, explorer, linguist and ethnologist. He explored these areas studying the flora and fauna. He lived with different tribes and learned the different languages of the area. He wrote articles about the plants, people and languages of eastern Tibet and southern China. Many of these articles were published in National Geographic. James Hilton was an English novelist who read many of Rock's articles in National Geographic. I first learned of James Hilton at LSU-S in a class of Dr. Martin's in which she told us that Hilton's novel, The Lost Horizon, was the first mass-market paperback published in America. The Lost Horizon was written in the 1930s. In this book Hilton describes a utopian civilization hidden and kept isolated from the rest of the world in the mountainous boarder lands between Tibet and China. Hilton named this utopia Shangri-La. Never having traveled to the area himself, Hilton based his description of the fictional Shangri-La on the writings of Joseph Rock. In 2001, the Tibetan county of Zhongdian in the north of China's Yunnan province applied to the central government to change the name of the town and to request for money to be invested for the purpose of tourism. Instead of Zhongdian the town would now be know as Shangri-La. These changes were made to attract tourism and they have. Though still quite small, the town has grown rapidly in the last ten years. Many women and some men in China wear glasses frames without lenses. These frames are usually very thick and most of the ones I've seen are black though they do come in other colors. They serve no function. There are no lenses in the frames so they don't help the wearer to see any better. Ask someone why she is wearing fake glasses frames and she will inevitably reply that they are fashionable. If you ask this person, who is usually in her mid-twenties, why anyone over the age of twelve would find this fad fashionable she will simply giggle and declare that she doesn't know but that it makes her face look better. Often people will insist that it makes them look more intelligent even though in reality it almost always makes them look ridiculously stupid. Fake glasses alone is not enough though to be fashionable. To be truly envied as everyone here desires you must have a smartphone and not just any smartphone will do. The most coveted is the iPhone. If you don't have an iPhone not as many people will wish they were you. Everyone wants an iPhone and if you don't want an iPhone no one will understand why. The problem with the iPhone is that it is expensive. The sticker price on an iPhone is easily a month's salary for many people. For some it's two month's salary. Most people can't afford that. Luckily for these poor wretched souls there is no need to lose face over not being able to afford the best. Even if copyright laws exist in China everyone ignores them. 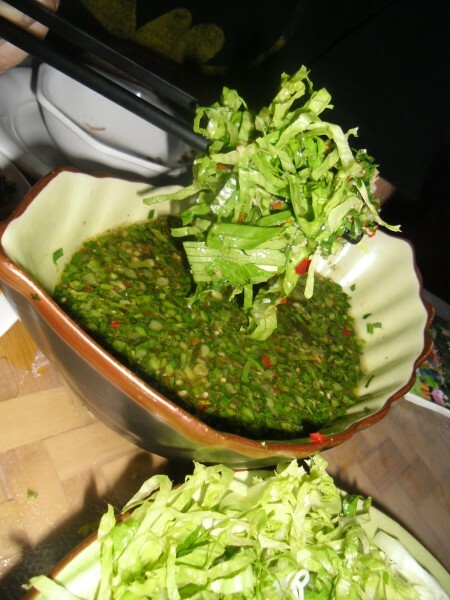 One of my recipe articles on Hubpages, for example, has been copied to a Chinese website. No one thought to ask me for permission or to offer me any compensation. They just did it and they probably don't think that there is any problem with this. Other than informing Google of the situation there isn't much that I can do. I guess I shouldn't complain too much since a third of the movies I watch in China I'm almost certain are pirated and the rest are questionable. You really only know for certain when it is an obviously cammed movie. Some of these you can't even tell unless someone stands up in the audience. If you restrict yourself only to movies that you've bought and paid for, you still have no idea whether or not the movie was pirated. So there isn't much you can do about this either. But there is something that can be done if you want an iPhone and you can't afford one. You can simply buy a fake iPhone. Because those pesky little copyright laws don't really get in anyone's way here, fake iPhones are sold by myriad legitimate electronic stores and department stores all over China. They look just like iPhones. They're the same size, shape, and colors of real iPhones. They even say iPhone on them. The Apple logo is prominently displayed on the back of the phone just like with the real one. It even says Apple on the box. At least it says this in English. In Chinese the box usually does inform you that the phone is a fake one. A fake iPhone may be as much as a fourth of the cost of a real one. It will also comes with hundreds of free apps. With a fake iPhone you'll have every fake app that you could possibly want and more than you could ever use. This is a good thing because even though you can sometimes connect to the internet, the one thing you can't do with a fake iPhone is connect to the online Apple Store or download anything real. But don't worry, if you do download something from another website the last thing you will have to contend with is Apple's notoriously annoying DRM which makes you jump through a thousand little hoops to prove that you really do own what you are transferring to your device. Since it is a fake iPhone there really is no point in proving that you own what you've downloaded. I have a very real Anycall, which has no apps, no games, nothing fancy. It can't even take any pictures. All it can do is send and receive real text messages and real phone calls. It cost much less than even a fake iPhone but if I had a fake iPhone I could do so much more and everyone would so want to be like me. Fortunately however my really cheap but very real phone has really done every real thing that I need a phone to do for the last two very real years. The most recent holiday in China was National Day. Most people in China receive three to four days off for National Day starting October first. This year 100,000 Chinese people, who were unhappy with their appearance, spent their National Day Holiday visiting South Korea in order to get cosmetic surgery in order to make them look more attractive. It would seem that I'm living in a wholly unvoracious world where the tourist attractions are built on a lie and most of the people who visit them wear fake glasses, use fake iPhones and have eyes, noses, lips and God knows what else that were not included in the original manufacture's designs. If they were products and not people the warranties would have long ago been voided. And you thought this would be a post continuing my travels in Yunnan... Well it's a fake one. To be fair, Zhongdian is a nice little city. The area is beautiful and there is a subculture there that has only been marred slightly, so far, from the impact of tourism. However renaming the city Shangri-La for the sake of tourism is a bit misleading. It is also a bit unfair to to the various valleys and mountain towns throughout Yunnan, Sichuan and up into Tibet who believe that the descriptions of the fictional utopia more closely match their own geography. In the fake Shangri-La I was happy to find some very real things. There was goat's milk butter tea and yak butter yogurt. There was yak meat and goat meat. There were men who herded goats and yaks for a living the way men in their families have probably herded animals for as long as anyone can remember. These are real men who have the custom of carrying very real knives hanging from their belts. Other people in China often describe the people of this area as barbarians. One of the reasons for this is the custom of the men for carrying knives. People from other areas tend to think that carrying a knife is a little bit aggressive. It has a certain hint of possible violence. Few people take the time to consider though the reasons behind this custom. Most of these men make their living by herding animals. Try to cut a piece of rope or free a calf that has gotten caught up in some brambles without a knife and see how far you get in that endeavor. These are real jobs that a real knife might help with. I also noticed that while the minority people who actually live in Zhongdian carried knives on their belts, none of them wore fake glasses. The only people I saw there with fake glasses were the Chinese tourist. Probably very few of them, if any, carry a smartphone of any kind. A bunch of uncivilized, red faced barbarians... that's all these people are. And on goes the Skrullian invasion. Here are some real pictures of the fake-fictional-utopian-city that calls itself Shangri-La. We left Li Jiang and headed for Lu Gu Lake. In the Northwest of the Yunnan plateau, Lu Gu Hu is an alpine lake that forms part of the boarder between Yunnan province and Sichuan province. With an elevation over 8,000 feet Lugu Hu is the highest lake in Yunnan province. This location makes Lugu Hu relatively remote which currently makes it an ideal location for people living in China who've become disenchanted with the massive throngs of city dwellers who populated the burgeoning mega-cities. The considerable sparseness of the indigenous peoples however does little to improve local manners from western perspectives. A traditional Mosuo society was one of the few true matriarchal societies in the world. All property in this society belonged to women. Men owned nothing. The head of a household was the grandmother or the oldest living female. Property was passed down from mother to daughter. This means that men in these societies lived in their sister's homes. The concept of a walking marriage reminds me more of a courtship between certain types of birds rather than anything I've heard of practiced between people before. A man leaves his home in the early evening. He goes to the home of a woman he wishes to court. He is not allowed to enter or leave the house through any of the doors. Instead he stands beneath the woman's window and sings. He may sing for a short time or he may sing all night with no response. If the woman approves of his singing she will hold her window open. When she does this the man is supposed to climb up the side of the house. If he can make it to the window he spends the night there leaving before sunrise and returning to his own home. While walking marriages are part of the traditional Mosuo society it is really unclear as to whether this form of courtship is still authentically practiced. In the area around Lugu Hu, people claiming to be Mosuo lecture tourist about walking marriages and even demonstrate scaling a wall to get into the window on the second floor of a building made of logs. Whether these people are really Mosuo and whether there is any authenticity in their demonstrations is debatable. The longer I live in China the more skeptical I become of anything that I'm told. I'm beginning to believe that there really are no Chinese people anymore. Instead China has become populated with the same Skrulls that have been plaguing the Marvel Comics Universe for years. The Skrulls are real. They're here and they are simply pretending to be Chinese. What happened to the real Chinese? Only the Skrulls may know. Though the area around Lugu Hu is relatively less populated there are signs of development. All of the development looks geared toward tourism. No one is building houses here, they're building hostels with adjoining restaurants. While there may be many people here who are Mosuo there are likely just as many who are not who moved here because they believe they can make a buck or two by telling people they are Mosuo. Deep in the mountains away from all of this there are likely still a few minority villages that are legitimate. These however will only remain until some enterprising young Skrull finds them and decides to turn them into yet another tourist attraction. There are other minorities in these parts. There is the Naxi people, the Yi and many Tibetans among others. 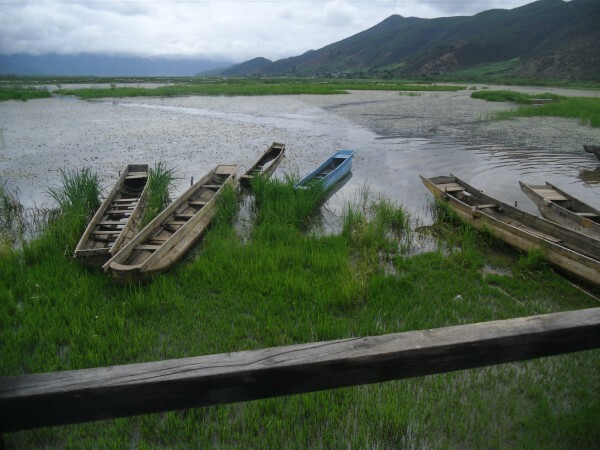 Mosuo people, who are actually a branch of Naxi, call Lugu Lake “Mother Lake.” To get into the villages surrounding the lake you must buy a ticket. The tickets and a “passport” they give you at the gate describes the area as The Kingdom of Women. Tourism aside, Lugu hu is actually a pleasant place for the moment. It is surrounded by mountains. There are no skyscrapers diminishing the views. Everything is relatively peaceful. The lake is encircled by a very long and very winding road that curves and snakes around the mountains Tourists can hike from one village to another. They can also rent bicycles and even van rides. The van rides will circle around a certain area stopping at “scenic” spots for people to take pictures. The truth is though that every spot here is a scenic one, you're just able to cover a but more distance in a van than on foot. The city is not without it's charms. 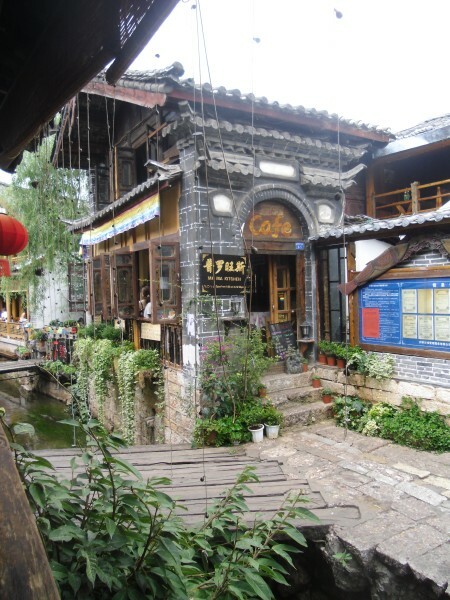 I suppose if someone has never visited one of these old towns, Li Jiang might be a wonderful place. It certainly looks great reviewing the photos. However charm that Li Jiang holds wore off with an alarming quickness. The best part of Li Jiang was before we even got into the city. We stopped at a supposedly famous street on the edge of the city for some rib soup. The rib soup was excellent. Li Jiang was not. One of the main detractors of Li Jiang is that it is a famous city that hundreds of Chinese people visit on vacation. They swarm into the city in much the same way that they push and shove in order to crowd onto a bus or an elevator and for much the same reasons that they all want to own the next new iPhone. On many occasions I've commented how Chinese people remind me of lemmings that walk upright. If just one throws himself from the precipice of group thinking into the dark and murky waters below millions more will rush to follow suit, stepping over each other in a blind and uncaring stampede in the process. That first little lemming may have been chasing something different but all the others simply want to follow another's path. Li Jiang, much like the iPhone, is popular because it is popular. Everyone wants to go there because everyone else wants to go there. What is special about Li Jiang? Nothing really. The town is pretty but that is it. The town is also way overpriced. Compared to other places that are similar the rates for hostels and prices for food and everything else is a bit excessive. I've grudgingly gotten used to the idea that everywhere I go I may have to pay the “wai guo ren discount,” where locals add a bit to the price of something just because they see a foreigner and they believe that all foreigners are wealthy and can afford to pay more for something. I'm not just talking about haggling either. There are many places where you can haggle on a price. But everywhere you go the first price given to a foreigner is always higher than the first price given to a Chinese person and they're more resistant to lowering the price while haggling. What is worse though is that people sometimes also raise prices where they're supposed to be fixed. Though I didn't really encounter the “wai guo ren discount” in Li Jiang the city seemed to turn expensiveness into a new art form. We sat in a cafe in the middle of an afternoon and because of the inflated prices we decided to order the least expensive thing on the menu. This turned out to be a Coke. 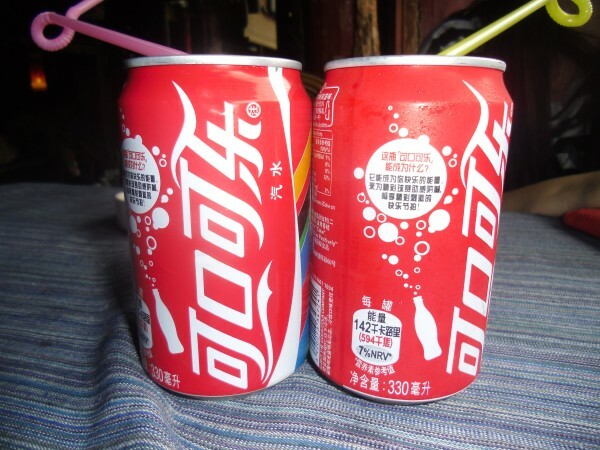 In Wuhan you would pay probably around five kuai for a can of coke. Even in Kun ming it would be about five kuai. The cans of coke in this cafe were twenty-five kuai each. I drank my coke with the small comfort that at least the Chinese people who came to this cafe were also getting screwed. Like in many other places the locals are pushy. Walk past them and they will assault you with whatever they are selling. They will refuse to listen to your denials. It doesn't matter that you don't want what they are selling. It doesn't matter that they are selling useless crap that you have no use for and would never buy. It doesn't matter that they are obnoxiously wasting your time trying to force you to buy something against your will. All that matters is that they believe that you have money and they believe that they can make you give it to them. Li Jiang is the closest that I've come to getting into a fight. One of the evenings we were there we decided to go look for a restaurant for dinner. There are small canals built into the middle of the streets. This leaves very little room to walk on each side. Along both sides there are stores built in long chains adjoining each other. We had to walk down one of these strips. There were music clubs here playing loud, funky, Chinese, techno, dance music. While trying to walk past one of these places a man put out his hand in front of me to make me stop and also to point toward the club, as if I hadn't already noticed the place. The first time he did this I thought it rude enough. I raised my hands in a gesture that I thought would show that I wasn't interested and just wanted to get by. As loud as I could I said “Bu yoa...” I don't want. I started to walk again and again this idiot put his arm out in front of me to stop me and point the way into the obnoxiously loud club that I had no intention of going into. Again I raised my hands tried to explain that I wasn't interested and waited for him to let me pass. This time when I tried to walk past him, he grabbed my arm from behind. Why do Chinese people think that it is okay to touch someone they don't know from behind? I turned without really thinking about it and shoved him into the crowd. In the next instant there where four young Chinese men forming a human fence between us. On the other side of me there was a woman explaining that they didn't understand what the problem was but that they just wanted to let things go and let us move on. We happily did so. In many ways this was an isolated incident. But at the same time the city of Li Jiang just seemed overly aggressive to us. The street peddlers seemed more aggressive than in other places. The place was overly crowded and neither of us enjoyed it. We couldn't wait to get out. Fortunately there was Lu Gu Hu. We arrived in Da Li on the 9th of July and we stayed there for three nights. Da Li is again an old town with a commercialized town center. There is a large lake near Da Li called Er Hai (Ear Sea because it is shaped like an ear). There is also a few mountains surrounding the area. Lakes and mountains have become my thing in China. When you are surrounded by and endless ocean of concrete in all shapes and forms on a daily basis you start to want to see a few trees. On the second day in Da Li we climbed a trail leading up one side of the mountain. The last day we walked around the lake. To get to the mountain we had to walk some of the roads. We came to a point where people were renting horses. Neither of us want to spend 400 kuai to ride a horse so we passed on this and started up the hill on foot. About halfway up man driving a horse and carriage offered us a ride up to the base of the mountain for ten kuai. We excepted the on the grounds that it sounded cool and was fairly cheap. It was more depressing than anything else. The horse was constantly trying to climb the hill and stopped only because the driver had a brake that locked up the wheels. With the brake engaged the horse still tried to climb but simply couldn't. The horse was in sad shape. You could see places where the harness had bruised the animal. There was also a place where the horse's skin appeared to be scraped and had recently been bleeding. Some of the horses that passed us going the other way looked worse than this. The place where the carriage stopped was a gate to a tourist area. Neither of us wanted to see this so we walked further down the road to the gate leading up the mountain. The Chinese have made an art from out of charging admission to every shrub and bush that grows here which they haven't yet cut down and paved over. Almost every mountain in China has a price tag if you want to climb it. My personal theory is that the fees are intended to offset the cost of the cement that will one day be poured when they dig up these last few shrubs and bushes. After paying the gate fee we started hiking. About halfway up we ran into a couple of guys who had beaten the gate fee by climbing up the side away from the trail. For obvious reasons the four of us became friends very quickly. The trail led about halfway up the mountain. Here it branched off in two directions no longer ascending but moving mostly around the length of the mountain. The trail here offered many excellent views of the city and the lake below. The four of us together walked the trail. Of course when I say trail here it is a bit inaccurate. There really are no “trails” in China. Rather there are concrete steps leading up to paved sidewalks with decorative stones. The four of us walked the length of the mountain sidewalk before descending through the trees. At the bottom we exchanged QQ numbers and parted ways. What is QQ? It's just like ICQ, Yahoo IM and MSN, except that it is Chinese. Like each of those others I have a QQ number. And again like each of those others I never actually use it. People often think this is strange and they don't understand how I talk with my friends without using QQ or IM. When I explain that only girls use chat programs they insist that this is wrong. When I explain that I wouldn't have time they remain confused. Er Hai is huge. We took a bus to get to the lake from where we were staying in the town. There is a very expensive fee to get into the lake which does include a boat tour but having spent all day before talking with our new friends about beating gate fees we decided to look around for better options. We found that if we walked out from the main gate there was a path that led down and around to the shore. Here we could walk around a stoney path for free. I figure that free is almost always the best option. We walked around the lake for a few hours stopping in a few places to take pictures. We found a hostel that was built at the end of a pier floating out over the lake. The hostel had a small cafe. We stopped there for a piece of cheesecake and some drinks before heading back. Once back in town we perused the commercial area for some good restaurants. Normally I try to look for places that serve local food. I'm the only foreigner I know who does this. Most foreigners look for food that they miss from their home countries. This is a bit odd to me, even after two years. Things I miss from the U.S. I can generally make at home. If I want a hamburger (which is rare) or a taco I can make that at home. And now thanks to another foreign teacher from Arizona I've even got an easy recipe for tortillas. I could buy these before from Metro of Wal-Mart but the recipe is very simple and a lot easier than shlepping out to Hankou on a two hour bus only to wander around a warehouse for another hour and stand in line between a bunch of pushy Chinese people. The problem with these old towns is their central philosophy of catering to what they think foreigners want. Half the restaurants serve western food. The other half serve a Chinese rendition of westernized Chinese food. In other words this is Chinese food that is cooked in a way that they think westerners will like it. Often this isn't as good as the westernized food in the U.S. There are a few places that serve small things that are local. Noodle shacks and street food are often the most authentic food you can find. Some of the “Chinese dish restaurants” are good but most are generic. This night I settled for a burger and fries while Xu Na ordered a mediocre pizza. Here in lies the other major problem. When you order something like a pizza from a Chinese restaurant you are basically playing what I like to call “Chinese Pizza Roulette.” Much like Russian Roulette, the results of this game can be disastrous. I'd even wager that Russian Roulette is safer. There are a few places I've found that can make a good pizza but most are beyond poor and bordering on obscenity. From Da Li we traveled to Li Jiang. Shangri La and The Lost Voraciousness. Kun Ming: The Capital of Yun Nan. We were in Kun Ming for two days. The thing about capital cities in China is that they mostly look the same. If you're in Kun Ming you may as well be in Wuhan. There are a couple of differences though. The first difference that I noticed is that the sky in Kun Ming was actually blue instead of the gun metal gray that often covers Wuhan. The second major difference is that it felt like spring. I had expected this because everyone had told me about it. The weather in Kun Ming is basically spring time all year round. There is a rainy season and a dry season but that is just about it. The city never gets cold and it never gets unbearably hot. There isn't much for people to do in Kun Ming. It is used mostly as a hub for people who are headed to other places. The most common of these other places being Da Li and Li Jiang which were both on our list of destinations. The first day we were in Kun Ming was a Saturday. We had flown in from Wuhan arriving mid afternoon. We basically did nothing that day beyond finding a hostel and a place to eat. That first night we found a restaurant near our hostel that served local dishes. This was a Dai Minority restaurant. There are several dozen minorities in China. With most of these minorities if you take someone from each one and strip them all of their ethnic clothing you'd have no way to tell them apart. These are not minorities in the sense of racial minorities but rather subcultures. A few of them though you can actually tell. The Zang minority for example usually has darker skin which looks very red. Zang are all over Yunnan, Tibet, Qinghai and western Sichuan. These are some of the reddest people I've seen anywhere. And the earth here matches the skin of the people. In most places in Yunnan the dirt is a dark red clay. There is probably no correlation here but it is very noticeable. The Dia restaurant was good. We didn't really know what we were getting when we ordered which is just the way that I like it. One of the things we ordered turned out to be a cold dish. This is by far one of the spiciest dishes that I've come across in China. I wish I could tell you the name but neither of us remember it. It was watery with chopped up green stuff at the bottom. We didn't really know how to eat it. We just dredged stuff in it and piled it up on top of our rice. This was one of my favorite meals during the whole trip and I have no idea what we were eating. The second day we met up with Shannan, an American friend of mine from Wuchang Experimental who visits Kun Ming every summer. There is a Chinese school there that she attends. A few other friends of mine from that first year went there too. I've thought about going to this school but never have. From Kun Ming we went first to Da Li. From Xi'an we returned to Wuhan by train. This was only out of necessity. A few weeks before leaving I had given my passport to the girls in the head office. They were to take my passport to immigration along with 400 kuia to renew my visa. Before giving them my passport I had made several photocopies of the front page and the page that had my most recent visa in it. I'd been told by many people that you could easily travel with such photocopies. What I had been told was correct. Beijing had been the only place where the photocopies had been a problem. When we got to Beijing we had gone with an older couple that we had met on the train to a hotel that their son had found for them. We had planned to stay in this hotel for one night and then find a hostel the next day. The lady running the hotel asked no questions and barely even looked at me. She did not even ask for a passport. All she asked for was the money. This is commonly referred to as a black hotel. Many things that are illegal in China are referred to with the color black. A private taxi which is just some guy with his own car who will try to charge you double what a real taxi will charge is called a black taxi. The black hotel in Beijing was a total dump. The beds were bunk beds with a hard sheet of plywood for a mattress. The floor in the bathroom was perpetually wet. The toilet wobbled if you merely walked past it. The hook that was supposed to hold the shower head in place was broken so the shower head hung down into the tub which was brown and not because it was supposed to be. The whole room was small but this was fine because we were only planning to stay there one night. The next morning we packed all our stuff and headed out to find a hostel. The black hotel was near a college campus and we had to cross the campus to get to the nearest subway station. Halfway across the campus someone, I wont mention who, decided to make a phone call. This phone call could have been made from the room before we had packed our bags but no one was thinking about it at that point. We were mostly focused on getting out of the black hotel. So I'm sitting in a parking lot of a university in Beijing while other people are chattering away in Chinese on the phone. I've no idea what is being said. In some ways I'm use to this feeling. In others, not so much. When the phone conversation ends I am told that the hostel we had booked will not take us. Since I didn't have my actual passport with me they didn't want to even talk to me. It seems that some time recently the Chinese government has decided to crack down on the illegal immigrants in China. They never really do anything nation wide here. They like to phase things in starting with one area and moving out from there. Since most of the illegals are in Beijing they decided to start there. This also means that every legitimate hotel and hostel in the city would not accept a foreigner without their actual passport or a receipt showing that the passport was in the immigration office. I'd given the passport to the head office a week before so of course someone had already taken it to immigration and gotten a receipt, or so I thought at the time. I made a couple of phone calls and soon learned that everyone in the head office was gone because of the Dragon Boat holiday. The ones that I talked to were not even in Wuhan any more. It had also become questionable as to whether the passport was at immigration or still on someone's desk at our head office. All these phone calls took a few hours. These were hours standing in a parking lot in the middle of a university in Beijing with backpacks full of everything we currently possessed. At the end of all this we marched back across the university, went back to the black hotel again and checked back in. Everyday after this it became a running gag to suggest that we should pack all of our stuff, check out, and walk around for a few hours before coming back just to check in again. Beijing was the only place in which this was a problem. In Pinyao they asked a few questions but only because they didn't know where the passport number was. These were the same questions they would have asked had we had my passport to begin with. While we were staying there a foreign couple showed up who were also carrying photocopies. The lady running the hostel actually came and found Xu Na to ask her where the number was on his copies. Again in Xi'an there was no problem. The people there accepted the photocopies and this time they actually knew what they were looking at. The plan from the beginning had been to stop in Wuhan to pick up my passport when it was ready. We made certain through emails and a few text messages that the passport would be waiting for me on Ham's desk before I arrived in Wuhan. We were in Wuhan for two days. During this time we washed all our clothes, I grabbed my passport and we spent a day in Starbucks. When I picked up my passport from the office I was pleasantly surprised to find that the coveted visa had actually been processed as promised. On the second evening I went to Nanhu to hang out with a couple of friends there. The following morning we packed our now dry and clean clothes once more and headed to the airport. Our next destination was Kunming in the province of Yunnan in southern China. We had tried to get train tickets there but this proved impossible so we settled for plane tickets. This was probably the single most expensive part of the trip. No pictures this time, because frankly all we did was go to Starbucks and you already know what that looks like. There will be a feel next time. I've not mentioned the food of Xi'an yet. 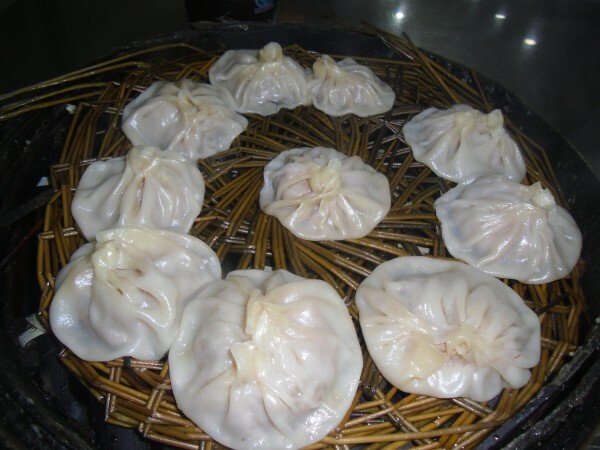 In northern China noodles and dumplings are more common that rice. Most of the rice fields are in the south because the land and the climate in the south is better for growing rice. There is also a sizable Muslim community in Xi'an. I'd been told before that there are lots of Muslims in Gansu province. Xi'an is in Shaanxi province which is mostly east of Gansu and partially circling the other province. In most cities there is at least one street lined with booths from which venders sale an assortment of food. In Xi'an there is Muslim Street. On both sides of the street there are small shops, large restaurants and an assortment of small venders. Most of them sale food of some kind. Many of them sale noodles. Several sale dumplings, boa zi. These dumplings are usually some kind of meat or vegetable mixture wrapped in a dough shell that is pinched together at the top. These are usually steamed. Some places serve tang boa. Tang means soup. These magical dumplings contain a small ball of meat and are filled with soup. I've not yet figured out how they make these though I do have a number of possible methods in mind. It could be a two person process where one person holds the purse-like dough as the other spoons the soup into it. I figure this would be inefficient, slow and potentially lazy. They might freeze the soup and wrap the dough around a frozen scoop of soup. They might use a straw to pour the soup in right before closing it. I suppose I could Google it but I've not yet resorted to searching for the answer online. I kind of would like to figure out a way it could be done myself. It is also fun talking to people about tang bao. I find that most people have never thought about how they are made before but once you ask them about it they get this quizzical look on their face and become just as interested in trying to figure it out. In general tang boa make me happy. You're supposed to poke a whole in them, drain the soup into a spoon and drink it before finishing the rest of the baozi. But it is so much more fun just to pop the whole thing in your mouth and let the soup burst out the sides of the dumpling over your tongue and down your throat as you chew. Most of the people on Muslim Street are Muslim. You can tell be the little white hats the men wear and the scarves that the women wear. Although, knowing the Chinese penchant for forgeries it would not be surprising to discover that some of them are simply wearing the hats and scarves without actually being Muslim. Conspiracies aside the Muslim Chinese food is generally very good. Muslim street is usually packed with people. There are little alleys that branch off where more venders can be found. Every night that we were in Xi'an we returned to Muslim street. We had tang boa, rou ja muo, a kind of sandwich made with shreds of chicken and a couple of noodle dishes.There was a noodle soup dish that also had little balls of dough in it. There was a rice pudding cake thing on a stick that was really quiet disgusting. There were people selling meat sticks everywhere, beef, pork, chicken and lamb and an assortment of veggies tofu and strange meats I couldn't identify. The place was rather crowded because it is a very popular spot. Despite the crowds Muslim street is probably my favorite place in Xi'an. The third day in Xi'an was a Monday. 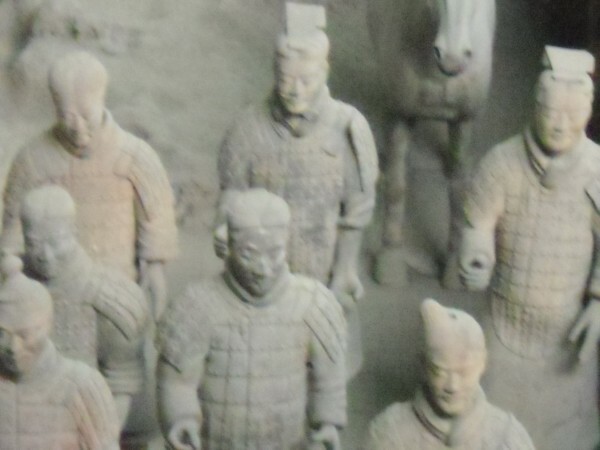 The main reason for going to Xi'an is because I wanted to see the Terracotta Warriors. Some of you may remember when I left home that I said the main thing I wanted to see was the Terracotta Warriors. We waited till Monday to go based on the idea that on the weekends there would be more people. We were probably right though there were still a lot of people there. It rained Monday also and we spent a lot of time outside sloshing through the water trying to find the right bus to take us to the museum. A few of the days in Beijing we had to deal with rain also. We spent a good two weeks wondering if we'd ever have a dry day. The bus ride out to the site of the Warriors was about an hour long, maybe a little more. There is a park area that the local government has built around the site. The cost to get in is 150 RMB per person. Everything in China cost money. If something has a UNESCO stamp or seal on it they will charge you as much as they think they can to let you in. It doesn't matter if it's an old and crumbling wall, the last remaining tree covered hill in China or a hole full of crumbled statues; you're gonna pay, and in many cases pay well, to see it. Beijing had not been too bad. Though everything there cost money to get into it the prices were reasonable. Though a bit high, the Terracotta Warriors still seems reasonable compared to some of the small town rip offs I've seen since then. There are three pits within the park. Each pit has a building built over it which serves duo purpose of protecting the site and giving the paying tourist a place to stand. The first of these pits is the largest though. People crowd into the building. Most of them are with tour groups with guides rattling off the ostensible facts about the site in Chinese. Occasionally I'd hear a person speaking in English though this was rare and usually there did not seem to be a guide with these people. The area you can walk in circles the parameter in each building. In the middle past the guardrails there is a dirt floor with deep trenches sunk into it. In the trenches are the Terracotta statues. Many of these stand erect but most of them lay in pieces scattered on the floor where they were uncovered. There is much more than just soldiers. There are many horses. Some of the horses stand pulling chariots. Other horses,, like the soldiers, lay in pieces. With the shattered heads and bodies of horses and soldiers laying laying randomly together many areas of the floor reminded me of Picasso’s Guernica. Toward the back of the pit on a plateau of earth there were people dressed in blue overalls sitting at folding tables. On the folding tables they had pieces of statues that they were cleaning and trying to piece together like giant 3-D puzzles. People who travel in China tend to travel in similar circles. In Ping Yao we had met an Austrian couple in a cafe. We ran into them again in the main pit of the Terracotta Warriors. We had made plans to leave with them but did not see them again on the way out. The other two pits were smaller than the first though the signs suggest that they were somehow more important. The whole site is actually smaller than you think it is. If you watch the Discovery Channel programs about the Terracotta Warriors you are left with the impression that the site is massive. In reality the first pit is about the size of a basketball court and each of the smaller pits are about half this size. There is the possibility that there is more which hasn't been discovered yet and there are stories about the first emperor's tomb that border on the absurd. Though the Warriors were not as impressive as I'd hoped it was still cool to see them.